Funeral services for Verna Dunrud-Kammen of Bader, MN will be held on Wednesday, March 20, 2019 at 1:00 pm at the Badger Creek Free Lutheran Church in Badger, MN. Visitation will be one hour prior at the church. Interment will be at the Zion Lutheran Cemetery in rural Gully, MN at a later date. Memorials are preferred to the North Region Pregnancy Care Center in Roseau, MN. 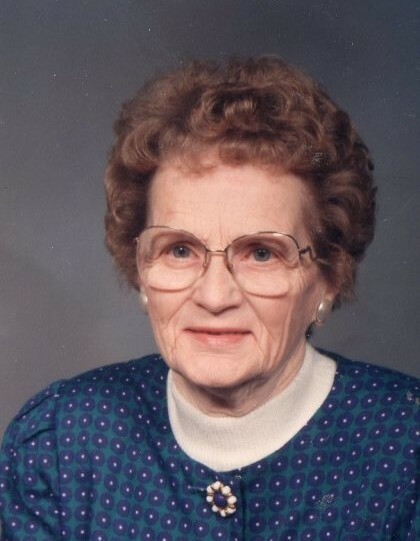 Verna L. Dunrud-Kammen passed away peacefully in her sleep on March 15, 2019 at the LifeCare Roseau Manor at the age of 98. Verna Lillian Dyrdahl was born on February 24, 1921 at her home in Eden Township, rural Gully/Gonvick, MN to Anton and Olive (Kjos) Dyrdahl. She later moved to a new house that her dad built closer to Gonvick, where she and her three sisters and four brothers grew up. They walked 1 ½ miles to Sunnyside Grade School and later attended high school in Gonvick. She stayed in town at a hotel most of that time and worked at the hotel and at the Felix Café which was owned by Evelyn Brandt. In 1963, they moved to Badger, MN where Kenneth was hired to manage the Diamond S Horse Ranch. There she had an electric stove, oil heat, washer and a dryer. Kenneth became ill and died in 1967. She married Albert Kammen in 1968, and they moved to a house in Badger with the three boys. Maybe that was where she got serious about making quilts for church missions. She counted over 40 quilts. Each child and grandchild received one made from the popular polyester fabric of the day. It was during these later years that she started developing her talent of writing poetry; totaling over fifty. Her poetry has been a blessing to all who read it. She is survived by her children, Carolyn Lange of Badger, Valerie Dunrud of Monticello, MN, Danny (Sissy) Dunrud of Badger and Tom (Chris) Dunrud of Verndale, MN; grandchildren, Brian, Chris, Krista, Eric, Amber, Daniel, Luke, David, and Kaitlin; 25 great-grandchildren; and sister, Margaret (Monte) Imsdahl. She was preceded in death by her parents; husbands, Kenneth and Albert; daughter, Suellen; son, Mark; grandson, Gabriel; great-grandson, Abram; and siblings, Mabel, Arnold, Lester, Russell, Eugene and Gertrude.